Thanks to Dr. Mariam A. Molani, University of Nebraska Medical Center, Omaha, Nebraska (USA) for contributing this case and Dr. Hillary Zalaznick, Myriad Genetics, Inc., Utah (USA) for writing for the discussion. To contribute a Case of the Week, first make sure that we are currently accepting cases, then follow the guidelines on our main Case of the Week page. (1) Twice a year, PathologyOutlines.com donates 10% of our Amazon commission to a nonprofit. For the second half of 2017, we contributed $486 to the Detroit College Promise, the nonprofit we started that provides scholarships to Detroit Public School students. To help support these efforts, just use our Amazon.com link on our Home Page or Books pages to buy Pathology books, non Pathology related books or any other items. (2) This past year showed great growth in the number of sessions, users and page views to our website. We had 8,837,168 total sessions in 2017, an increase of 56.6% from 2016. We had 3,617,471 users, up 65.3% from 2016. Our page views were 21,322,224, up 43.7% from 2016. For more statistics, click here. We believe it is important to have an adequate number of high quality images on our server, because images on other servers often disappear. If you own images of these entities, please email them as attachments to Dr. Nat Pernick at NatPernick@gmail.com, with any corresponding clinical history. There is no payment for image contributions but we will acknowledge you as contributor so please indicate how you want your name to be displayed. A 64 year old male Nebraskan farmer presented to an outpatient clinic with 3 months of progressive weight loss, early satiety, and weakness. His past medical history included hypertension, chronic kidney disease (stage 4), and coronary artery disease. His history was negative for recent travel, pets or animals on his farm, and tobacco/alcohol use. A colonoscopy was performed and multiple biopsies were taken. 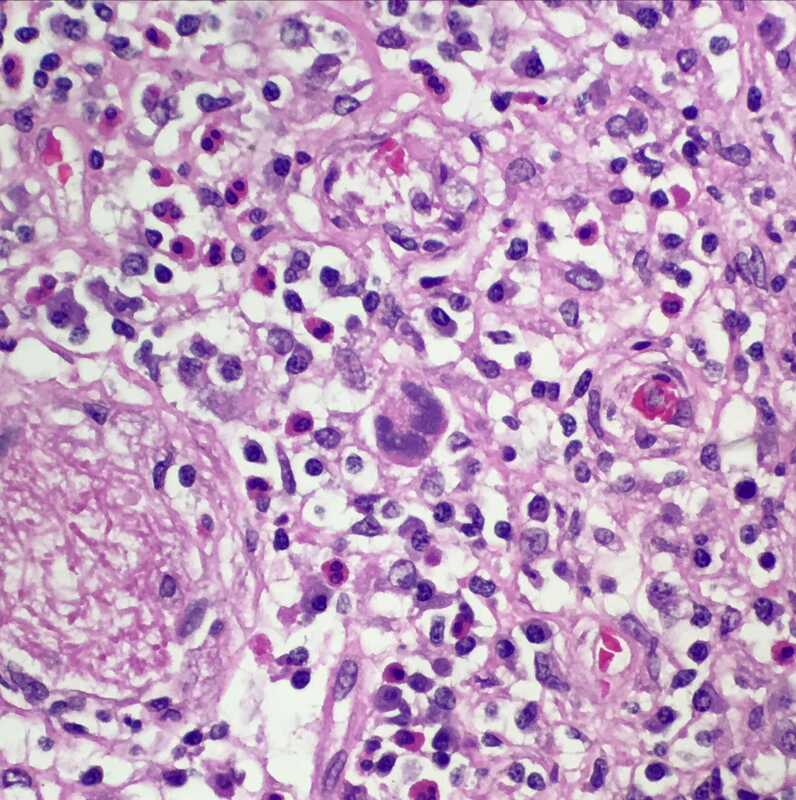 Which of the following best describes the histologic appearance of Histoplasma capsulatum? 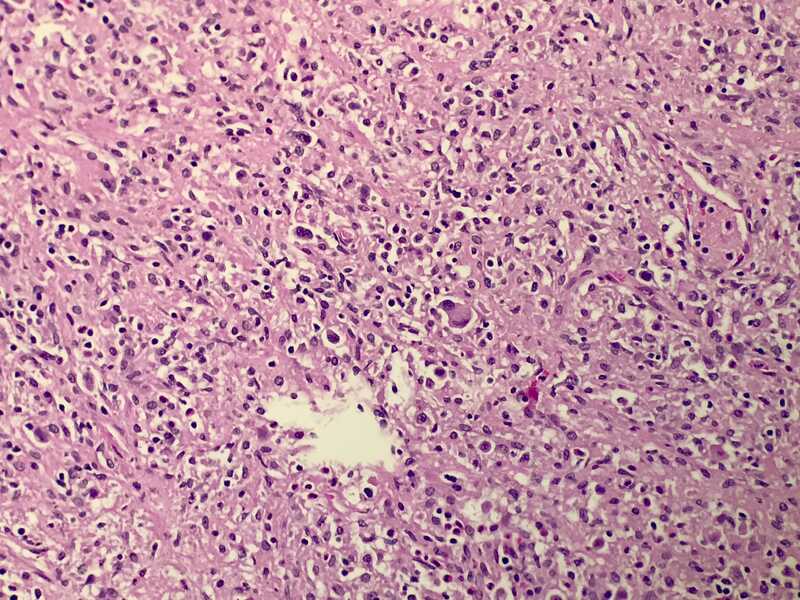 Treatment for the biopsy findings was started but the patient continued to decompensate and ultimately expired; upon autopsy, Hodgkin lymphoma was found. 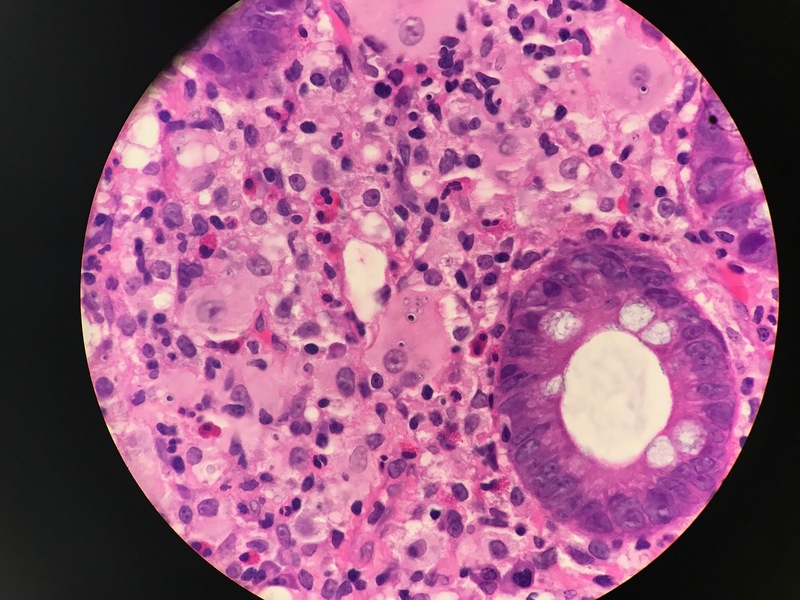 This patient’s colon biopsy showed mixed inflammatory cells and foamy macrophages expanding the lamina propria. 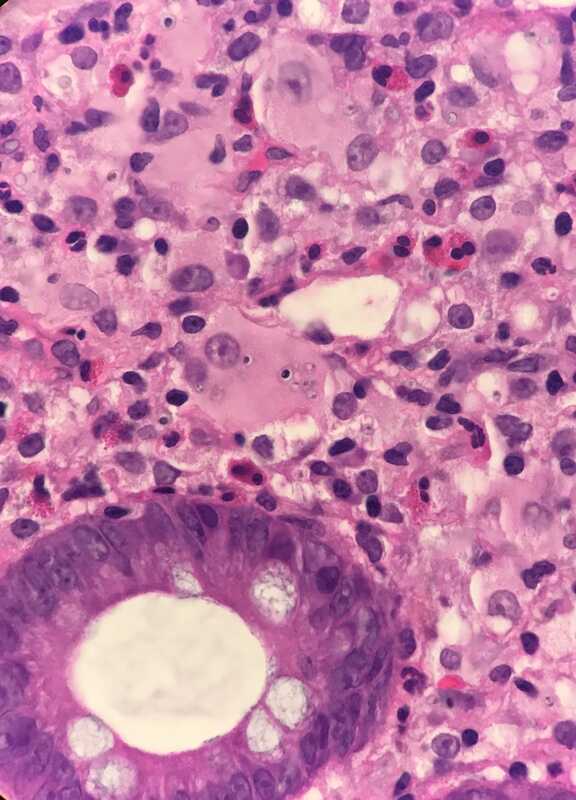 Collections of foamy macrophages in the GI tract such as these should be evaluated with AFB or Fite stains to rule out infection with Mycobacterium avium-intracellulare and with a PAS stain to rule out Whipple’s disease (infection with Tropheryma whippelii). 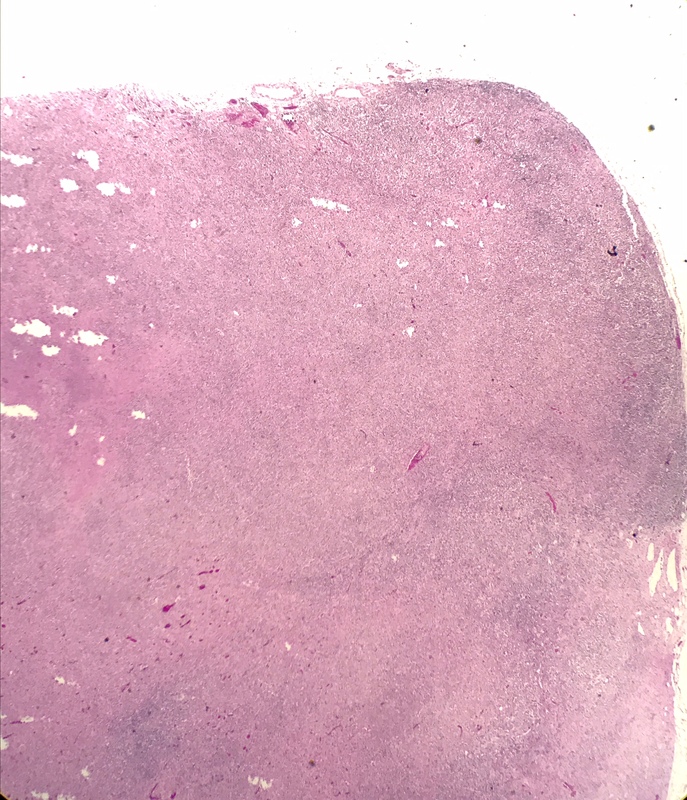 In this case, yeast cells are seen in the macrophages on H&E, which is confirmed by a positive GMS stain. Based on the size of the yeast cells, Histoplasma capsulatum is most likely. 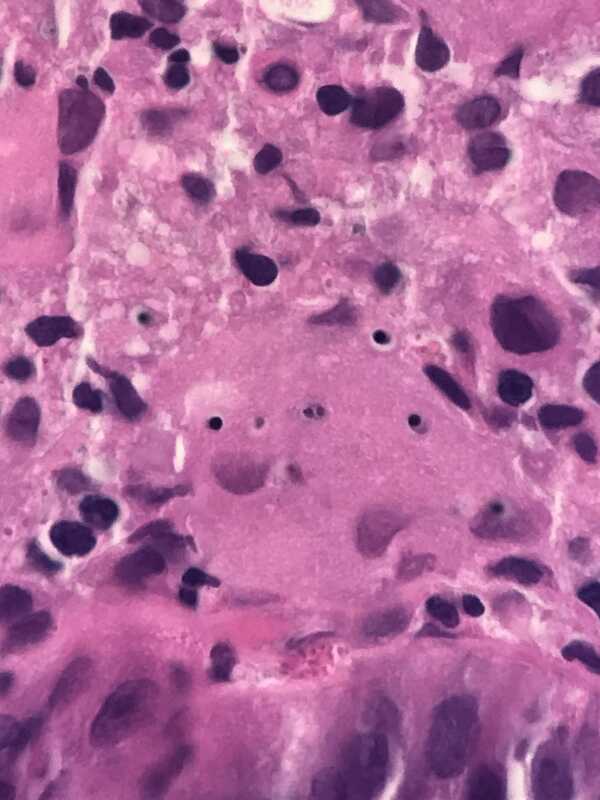 Histoplasma capsulatum is a thermally dimorphic fungus that behaves as a mold in the environment and as a yeast in tissue. In the United States, it is endemic mostly in central and eastern states, particularly along the Ohio and Mississippi rivers, where its spores reside in soil containing excrement from bats or birds. Only 1% of individuals exposed to spores develop symptoms. Acute pulmonary infection can occur 3 to 17 days after exposure. Acute pulmonary infection is characterized by a flu-like syndrome of high fever, chills, fatigue, cough and pleuritic chest pain. Mild cases usually resolve completely without antifungal therapy. 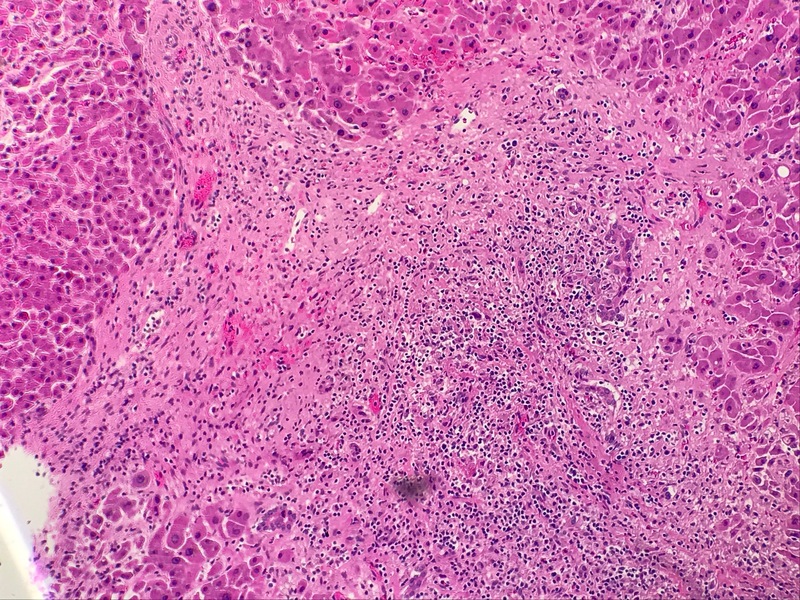 However some patients develop bulky mediastinal lymphadenopathy due to granulomatous inflammation or fibrosing mediastinitis, both of which can compromise mediastinal structures. 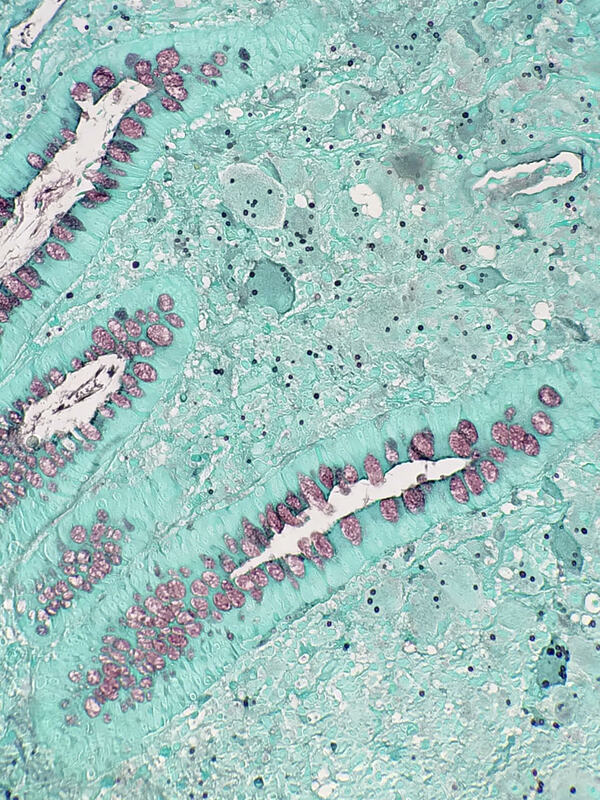 Patients with COPD can harbor chronic lung infections that lead to cavitary lesions. 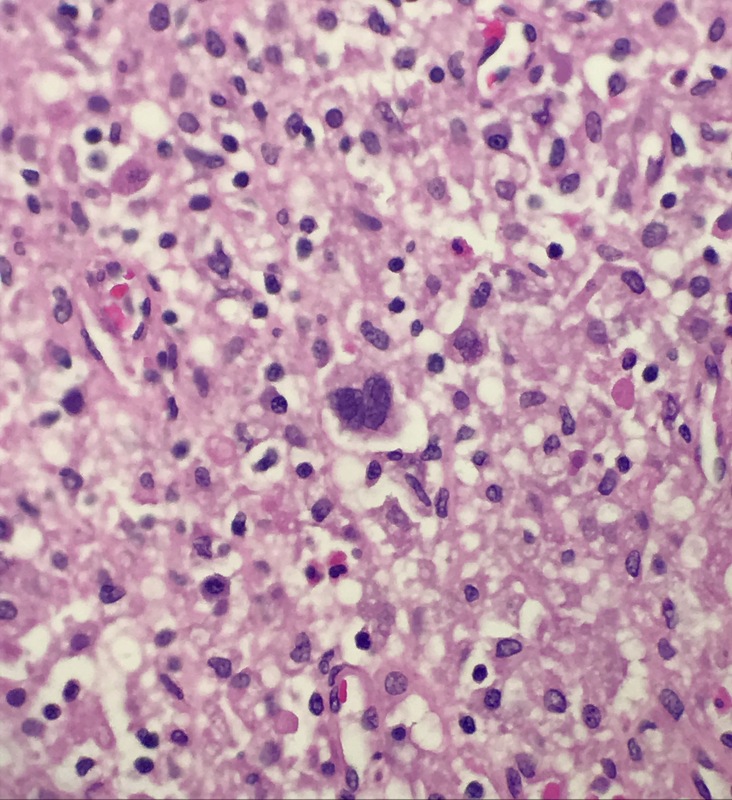 Immunocompromised patients (as in the current case, due to underlying Hodgkin lymphoma), infants and older patients are at risk of disseminated disease (CDC: Sources of Histoplasmosis [retrieved 10 January 2018], McPherson and Pincus: Henry’s Clinical Diagnosis Management by Laboratory Methods, 23rd ed. 2017). AIDS patients in particular are at high risk (Braz J Infect Dis 2017;21:7). 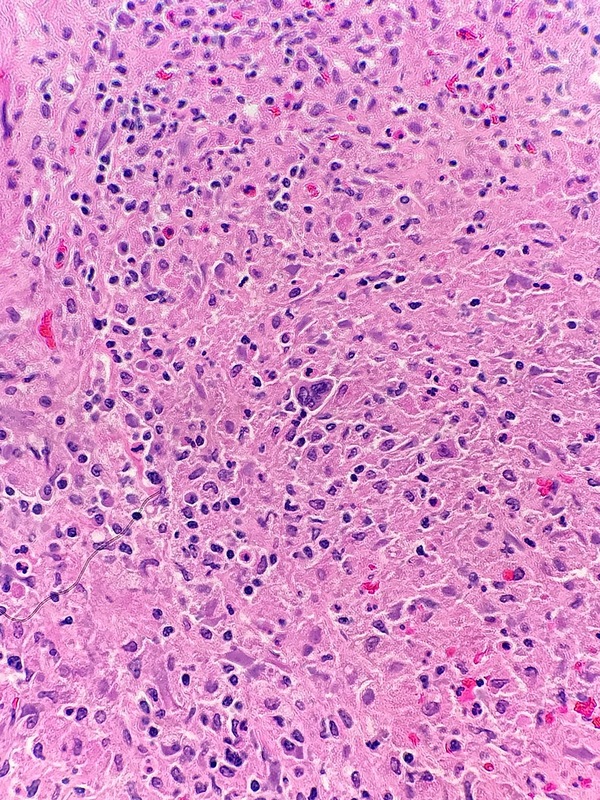 Disseminated histoplasmosis can cause lymphadenopathy, hepatosplenomegaly, thrombocytopenia, destruction of the adrenal cortex, chronic meningitis, intracerebral granulomas, endocarditis and lesions in the GI tract (McPherson and Pincus: Henry’s Clinical Diagnosis Management by Laboratory Methods, 23rd ed. 2017). 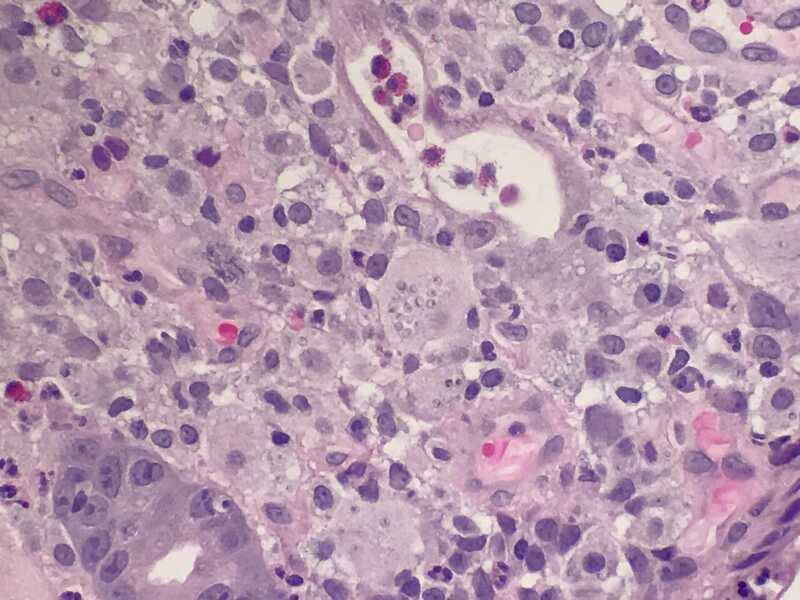 Note that the current patient’s autopsy findings of lymphadenopathy and hepatosplenomegaly could have been due to disseminated histoplasmosis but instead were due to involvement with Hodgkin lymphoma. 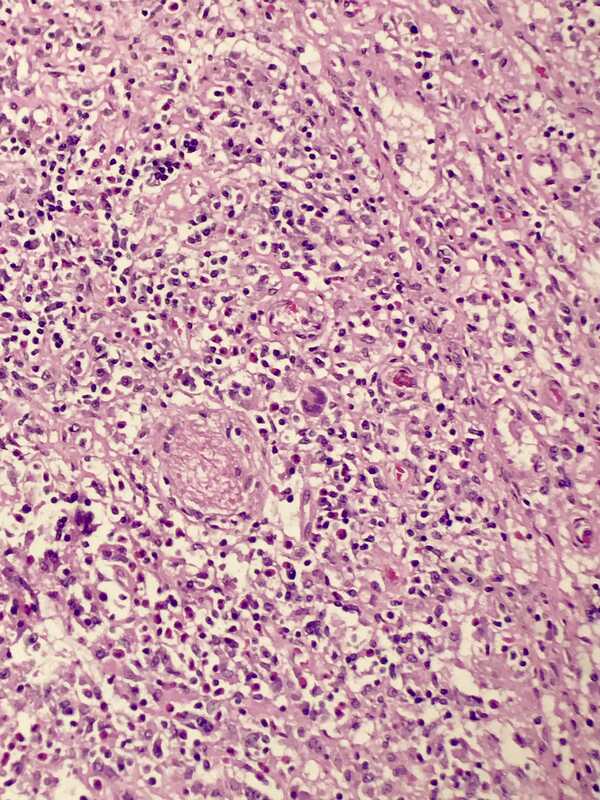 On histopathology, H. capsulatum lives in macrophages as yeast cells measuring 3-5 microns in diameter. The yeast cells have a single nucleus and can show narrow based budding. 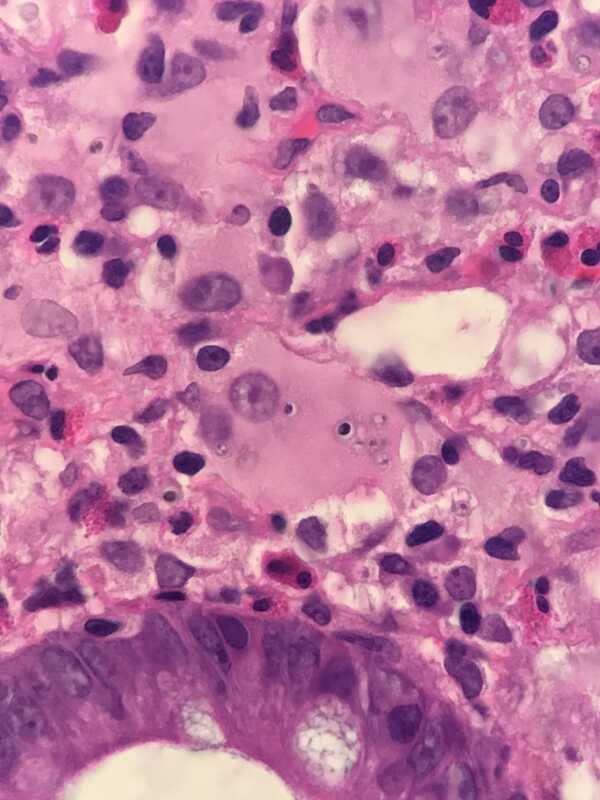 Active infections appear as collections of infected macrophages (as in the current case), non-caseating granulomas or caseating granulomas. 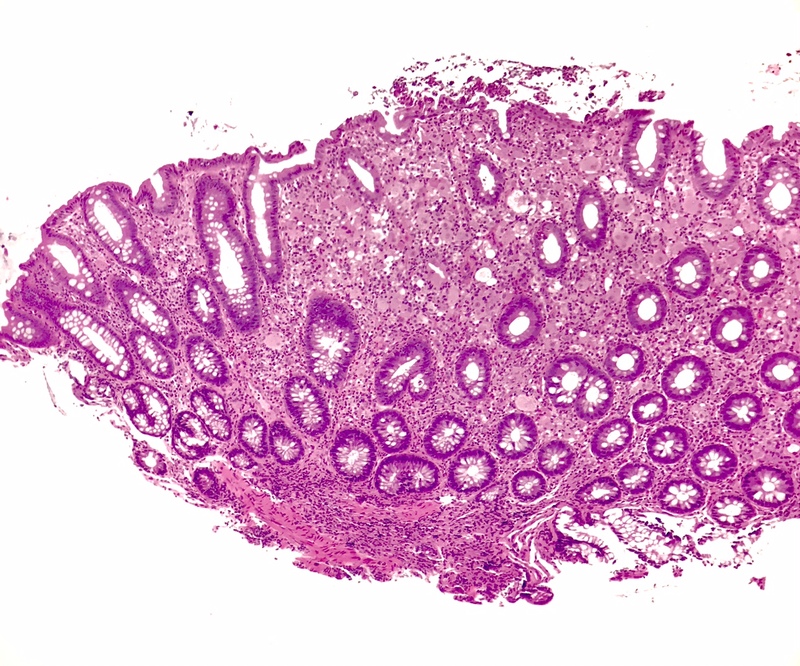 GI infection most often appears as diffuse lymphohistiocytic inflammation, ulceration or lymphohistocytic nodules; well formed granulomas are uncommon. 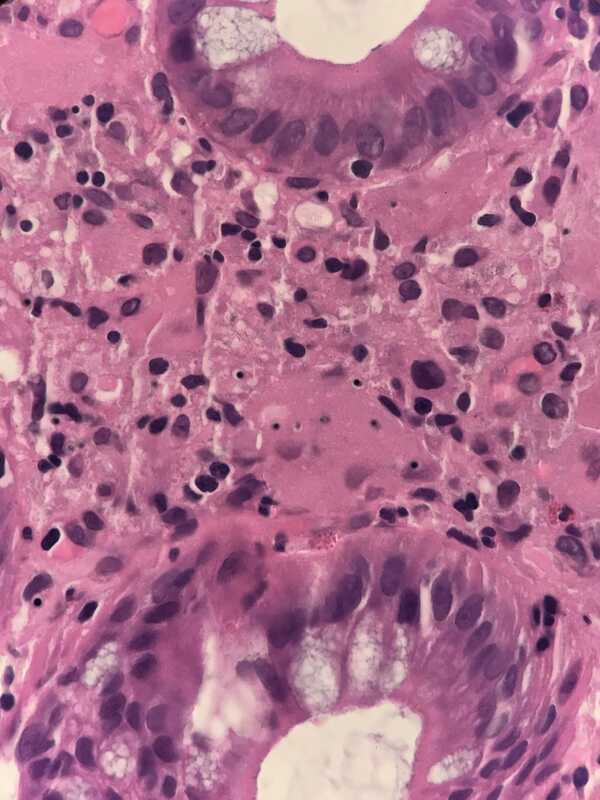 It can mimic Crohn’s disease in immunocompetent patients (Montgomery and Voltaggio: Biopsy Interpretation of the Gastrointestinal Tract Mucosa: Volume 1: Non-neoplastic, 2nd ed, 2011). 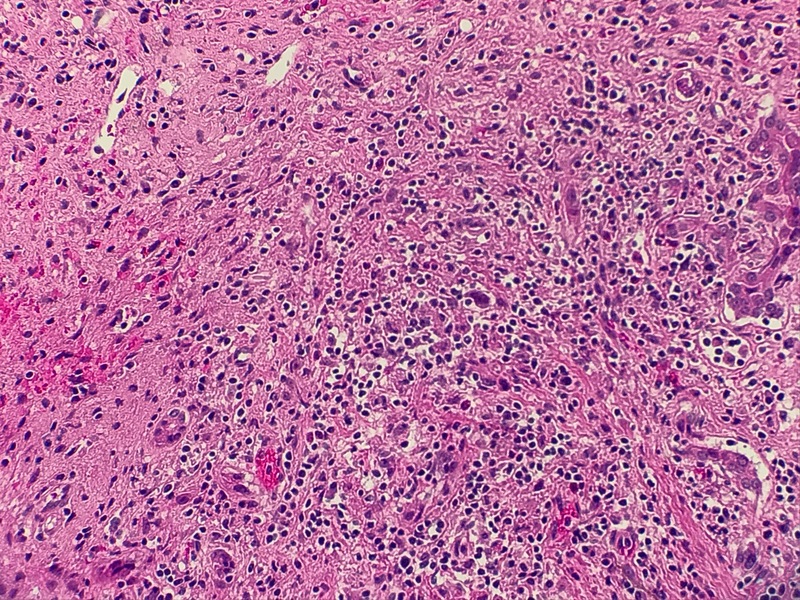 Resolved infections can have calcified “burned out” granulomas with a few yeast forms on GMS stain. 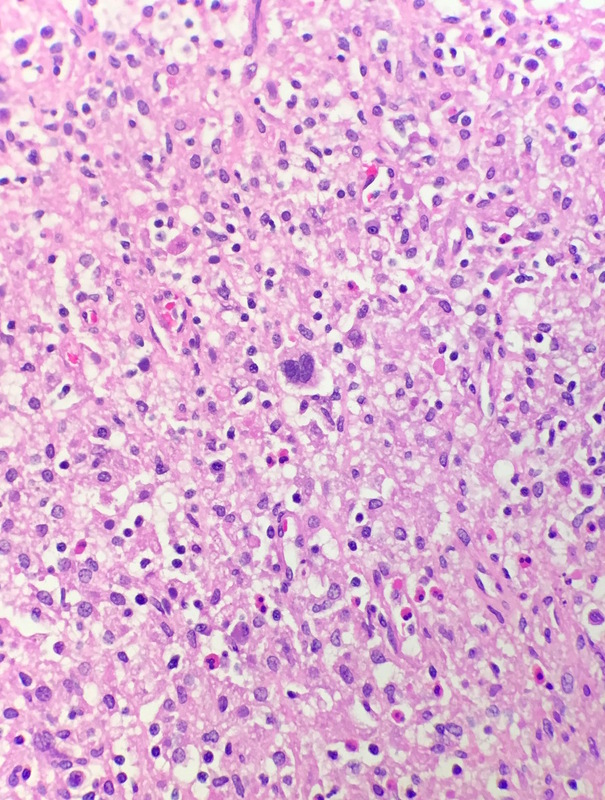 Definitive diagnosis of H. capsulatum should not be made from histology alone, however. If material is available for culture, it should be inoculated to an enriched agar such as brain-heart infusion agar supplemented with sheep blood and incubated at 25 - 30 Celcius (McPherson and Pincus: Henry’s Clinical Diagnosis Management by Laboratory Methods, 23rd ed. 2017). Colonies appear after two weeks but may require up to six weeks of incubation (Braz J Infect Dis 2017;21:7). The colonies are fluffy and white or buff brown in color. They produce macroconidia that have characteristic roughened projections extending from the periphery of the conidia. Converting the mold to the yeast phase can be difficult so identification is often done with nucleic acid hybridization probe testing of the culture isolate (McPherson and Pincus: Henry’s Clinical Diagnosis Management by Laboratory Methods, 23rd ed. 2017). There are a variety of noninvasive, nonculture based tests that can be used for diagnosis as well. A recent meta-analysis found that antigen detection in urine is currently the most accurate method (Braz J Infect Dis 2017;21:7), with a sensitivity of ~80% for acute pulmonary histoplasmosis and greater than 90% in disseminated infection. Antigen levels can also be monitored to evaluate the effectiveness of treatment (McPherson and Pincus: Henry’s Clinical Diagnosis Management by Laboratory Methods, 23rd ed. 2017). Treatment with amphotericin B or itraconazole is recommended for patients with severe acute and chronic pulmonary infections, symptomatic mediastinal disease and disseminated disease, according to guidelines from the Infectious Diseases Society of America. Prophylaxis with itraconazole is recommended for immunosuppressed patients in endemic areas. 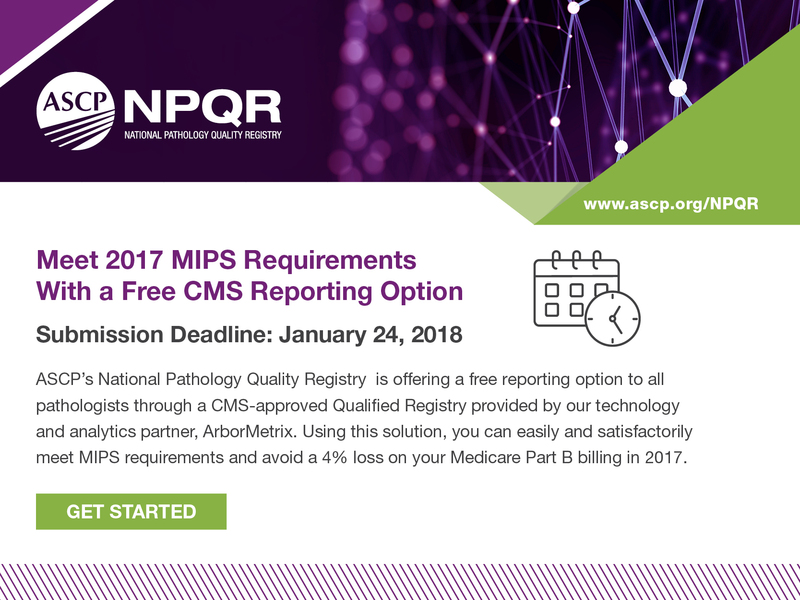 Patients with symptomatic histoplasmosis generally do well – the CDC website quotes mortality rates in hospitalized patients of 4 - 8% (CDC: Histoplasmosis Statistics [retrieved 10 January 2018]). However, AIDS patients tend to do poorly, with a worldwide mortality rate of ~50% (Braz J Infect Dis 2017;21:7). D. Small, intracellular, narrow budding.